Cardiacs were a wonderful band — pretty much any given lineup of the band is going to be awesome, but the lineup on the All That Glitters Is A Maresnest concert film is probably my favorite lineup. Or at least one of them, since, well, probably all the various Cardiacs lineups are my favorite. But this one especially so — I love Sarah Smith’s sax and William D. Drake’s keys and, well, just about everything. 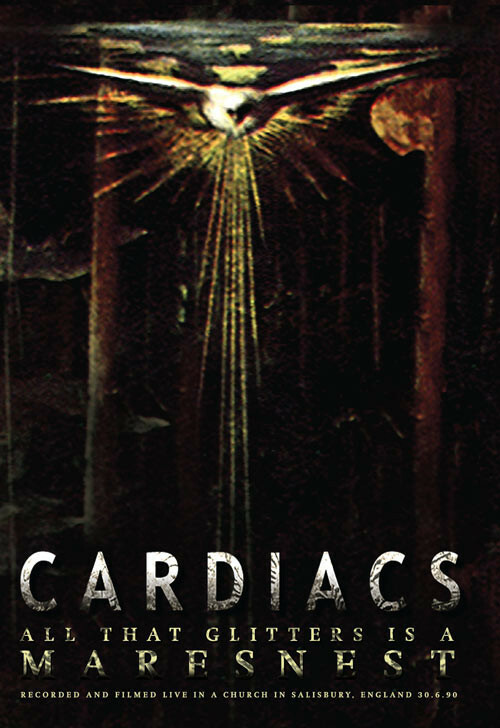 For being as loose and chaotic as they were, Cardiacs were also an amazingly tight group — musically, and devoted to the image as well. The fun thing with this is that it keeps Tim Smith’s stage banter — which takes the form of a childlike dictator with severe mood swings. He berates band members (who berate him back, until he pushes them in the face) and for “Hold My Love In My Arms”, he apologizes to the audience for yelling previously, says that we’re all friends again, and asks them to kiss each other… and gets explosively angry when the audience refuses to kiss to his liking. That said, persona-wise, it’s not just Tim — the film is interlaced with interstitials featuring all the band members saying things like “when you die and become a moth, you go to the light, which is Heaven, and then you fly around and around the light and your wings get burned to shreds”. These bits are fun and strange in the best way that Cardiacs are. The DVD of the film (previously released on VHS) sadly doesn’t have any extras (perhaps that means we might get an expanded Seaside Treats on DVD soon? ), but the audio quality is wonderful — and the picture quality is pretty good. It was shot on film, so the picture is very nice — I was worried it was going to be shot on video, or worse, a mere “upgrade” from the original VHS release (much like the DEVO DVD of The Complete Truth about Devolution was just a low-quality rip of the original Laserdisc) — but this has been transferred very well. My only complaint is that it’s non-anamorphic, so on a 16:9 television, the picture is windowboxed — keeping the original aspect ratio (yay!) but making it all small on your TV (boo! ).